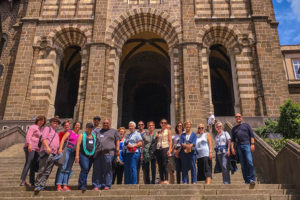 The CSJ Institute of Mount Saint Mary’s University had a wonderful time exploring the rich history of the founders of the Sisters of Carondelet through France. Exploring the life of Mother St. John Fontbonne who served in leadership of the Sisters of St. Joseph before and after the French Revolution. It was in 1836 that Mother St John Fontbonne sent the Sisters to Missouri to do their work. The tour started in Annecy France not far from Zurich, continued onto Le Puy-en-Velay, France and finished in Lyon France. Le Puy is also one of the beginning points for the Compostela De Santiago and the Way of Saint James Pilgrimage. Quite an abundance of hist ory was taken in. We can assemble a special tour for you too, or work with you on one of our many standard tours!